While the Radko ornament studios continue to create traditional glass Christmas ornaments, the designers enjoy mixing in fun, festive Radko glass ornaments with an updated look too! 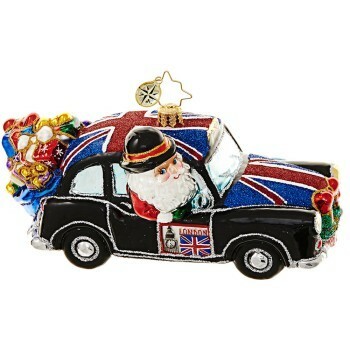 The Britain bound hitting the town Santa Christmas ornament from Radko features Santa in English derby and flowing beard. He’s traded his sleigh for a Rolls with his trademark sack of gifts in the trunk, or the boot as our friends in the UK call it. This British Santa and lumberjack flag Radko ornament is a delightful gift idea for anyone of English heritage and collectors of Radko or Santa ornaments. Grandparents enjoy this personalized Radko ornament we are happy to hand personalize with the details you provide. An optional Radko ornament gift box is available.